I’ve become obsessed with flavoured matcha over the last few months and watched it go from one or two flavours being available in the UK to a ton of flavours being available. I decided I’d put together a comparison post for all the flavoured matcha I can find, there’s even a couple from Barcelona thrown in. I haven’t quite finished the comparison yet but in my search I was excited to discover that T2 now do a few flavoured matchas. I reached out to them to see if they fancied being included in my comparison post and they were kind enough to send me their Cinammon matcha and a hella fancy glass mug to go with it. As they were generous enough to send me these I thought I’d write a post up just about their products to begin with and then add them to the comparison post too. Read on to find out what I thought! The first thing I always notice about T2 products is how phenomenally presented they are, if you haven’t been to one of their stores yet I urge you to do so. I particularly like their Regent Street and Tottenham Court Road stores in London, their staff are always more than happy to make up a batch of any of their teas for you to try and they’re super knowledgable. 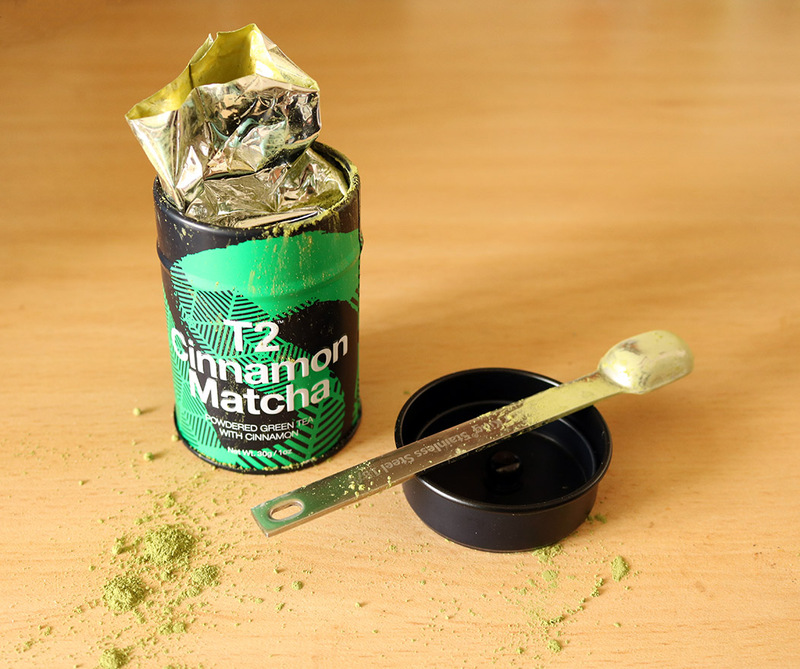 The quality of the packaging is instantly obvious with their flavoured matcha as you can always expect from T2. It comes in beautiful black tins with vibrant colours that are always in pristine condition. Inside the lid of the canister there’s a second lid that really helps to keep the matcha fresh, not that it’ll hang around for long once you’ve tasted it  Inside the canister you’ll find a totally sealed foil packet so you know your matcha is perfect from day one. Straight away I was impressed with the bright vivid green of T2’s matcha and the cinnamon fragrance explosion that took place as soon as I snipped the top of the packet. 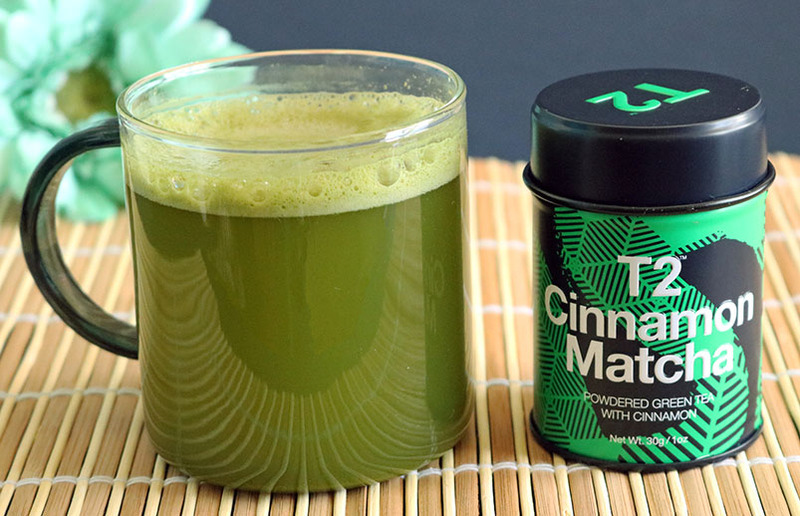 I did wonder if the cinnamon would be too spicy and overpower the matcha but I could tell from the sweet cinnamony scent that this wouldn’t be the case. T2’s cinnamon matcha blends amazingly with the water and the froth it produces is really incredible, you literally get about a centermetre of frothy joy on top of each batch. The cinnamon flavour is as the fragrance promised, sweet and puddingy! It reminds me of cinnamon buns but not quite as sweet and the balance of cinnamon and matcha is superb. Another thing worth mentioning is I recently bought a pack of T2’s unflavoured matcha sachets so I can get a matcha hit while I’m on the move (my matcha addiction has got pretty serious in recent weeks ) and I love the vibrant green goodness that bursts out of each sachet. 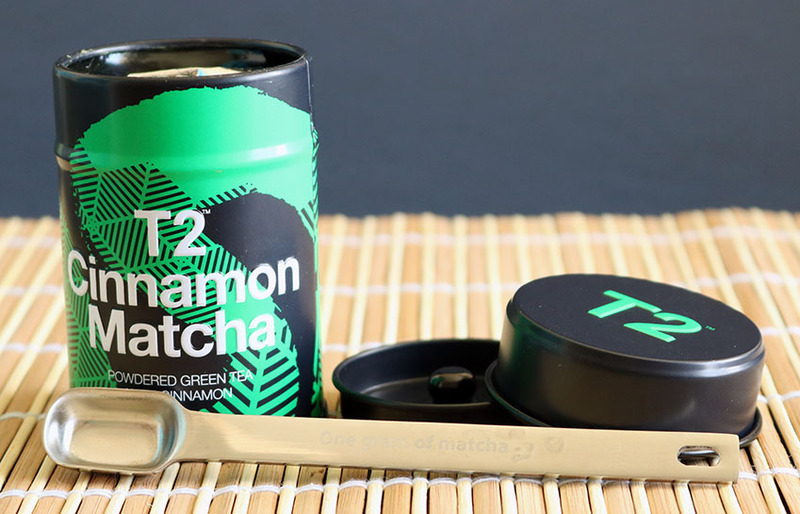 It seems T2’s matcha is top quality whether it’s flavoured or not, some other flavoured matcha I’ve had has clearly been lesser quality matcha hiding behind a flavour but this totally isn’t the case with T2. When I opened my much awaited T2 delivery I was thrilled to find that they’d also included one of their glass mugs. 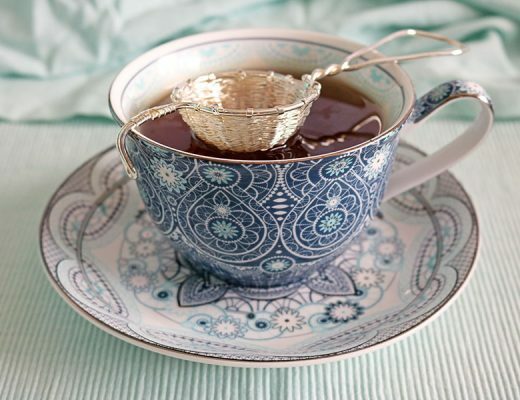 Another reason to visit a T2 store is their teaware, it’s simply divine! It is quite expensive but their quality is one of the highest I’ve seen, from their teapots to their glassware, it’s all fantastic. The black glass handle really works alongside the bright green hues of the matcha. 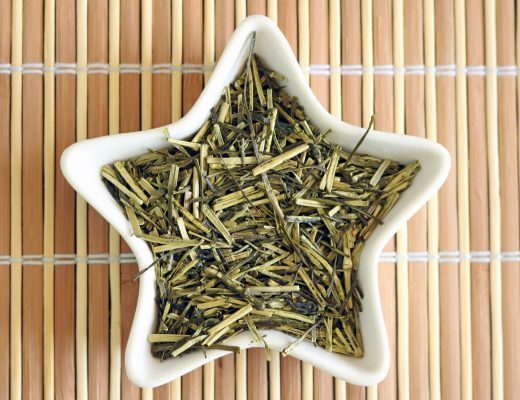 It’s really a joy to use and adds an extra element of sophistication to any matcha session. 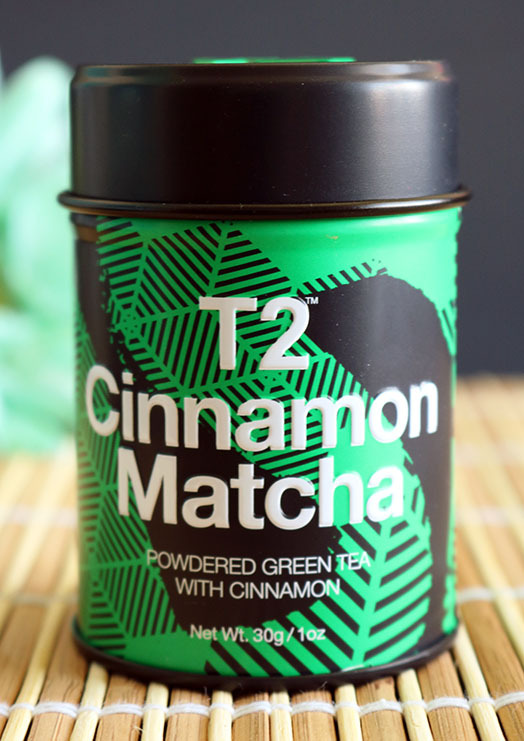 I’ve really enjoyed my time with T2’s cinnamon matcha and cannot wait to try their other flavours once they’re back in stock in their London stores. If you’d like to buy their flavoured matcha too you can find them on their website, there’s a choice of Cinnamon, Chocolate or Mint. A massive thank you goes to T2 for being awesome enough to send me their wonderful products to review. Another huge thanks goes to you guys for reading my review, it means so much to me! 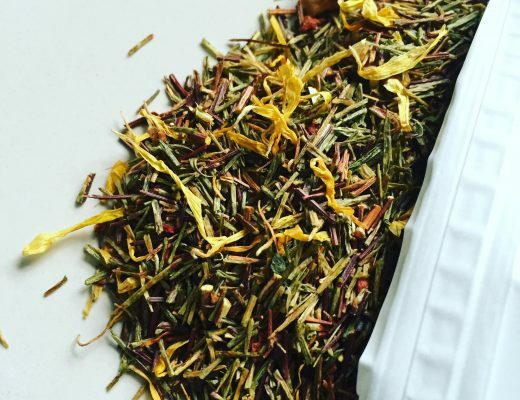  Remember to come find me on Twitter, Facebook or Instagram, I’m always happy to talk with any fellow matcha lovers!